Ref. 6222, 6422 ?Yellow 1/4 Century Club? A lot of five Rolex "Eaton, 1/4 Century Club", three bearing Ref. 6222, and two Ref. 6422. Rolex ?Eaton 1/4 Century Club?, Ref. 6222 and Ref. 6422. Made circa 1953. 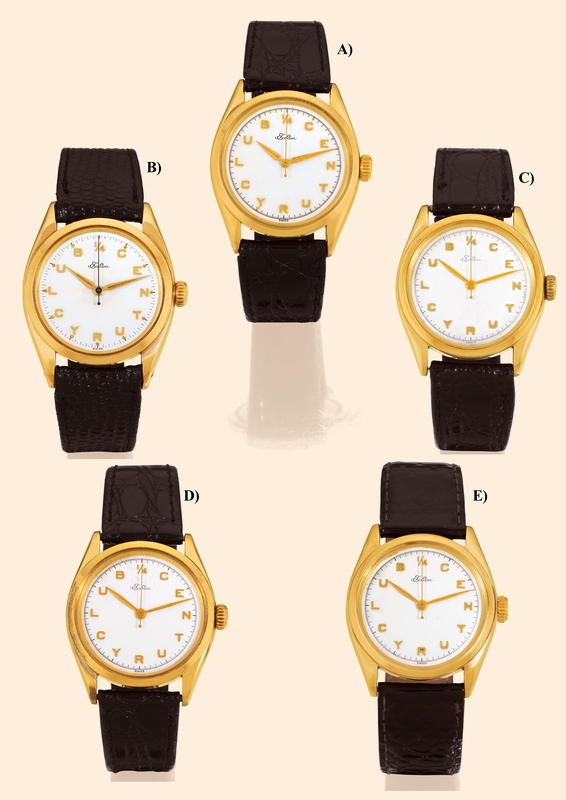 Fine and rare, center-seconds, selfwinding, water-resistant, 14K yellow gold gentleman?s wristwatches. C. Three-body, solid, polished, screwdown case back and crown, concave and curved lugs, back engraved with dedication "to mark a quarter of a century of continuous service at the T. Eaton Co. limited". D. Matte silver with applied gold letters "1/4 Century Club" instead of the hour numerals. Yellow gold hands. M. Cal. 10??? Precision, rhodium-plated, 17 jewels, straight-line lever escapement, Superbalance adjusted two positions, shock absorber, self-compensating flat balance-spring, index regulator. Dial, case and movement signed. Ref 6222, Diam. 33,5 mm. Thickness 12 mm. Ref 6422, Diam. 34 mm. Thickness 10 mm. C. Three-body, solid, polished, screwdown case back and crown, concave and curved lugs, back engraved with dedication "to mark a quarter of a century of continuous service at the T. Eaton Co. limited". D. Matte silver with applied gold letters "1/4 Century Club" instead of the hour numerals. Yellow gold hands. M. Cal. 10 Precision, rhodium-plated, 17 jewels, straight-line lever escapement, Superbalance adjusted two positions, shock absorber, self-compensating flat balance-spring, index regulator. Dial, case and movement signed. Ref 6222, Diam. 33,5 mm. Thickness 12 mm. Ref 6422, Diam. 34 mm. Thickness 10 mm.